Down in the Tennessee hills...."
Eight states border Tennessee. They are Alabama, Arkansas, Georgia, Kentucky, Mississippi, Missouri, North Carolina and Virginia. 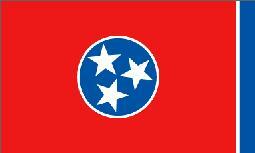 The three stars in the Tennessee State flag represent the three different land forms - the eastern mountains, the middle highlands and the western lowlands - all bound together by an unbroken circle. 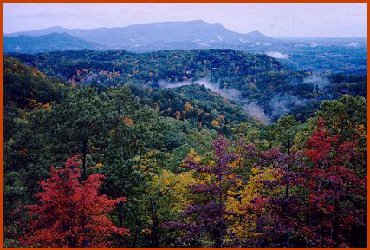 So, if you all have your hiking boots on, let's go see Tennessee's beautiful eastern mountains. On our way to the mountains, let's stop by Knoxville, Tennesee's third largest city, home of the University of Tennessee and the Volunteers. 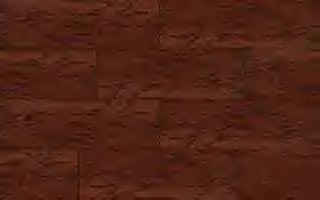 U OF TN was founded in 1794. 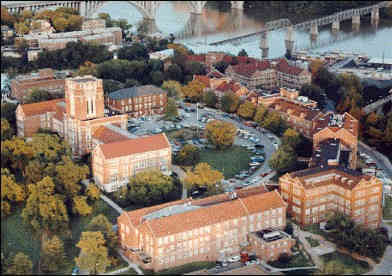 Isn't it a lovely campus, right on the Tennessee River. 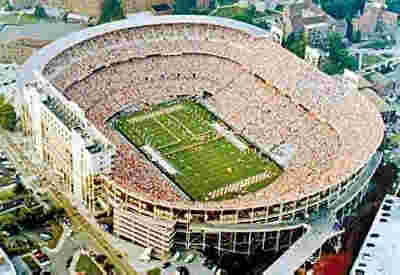 This is Neyland Stadium. Its physical size makes it the largest in the nation. It seats 102,854, second only in seating capacity to the University of Michigan. The stadium is always sold out. Over four million fans attended Volunteers' game in the past five years. OK, let's head for the mountains. Well, here we are in the middle of the Great Smoky Mountains National Park. Renowned for its fall foliage, skiing, hiking and camping, it encompasses 800 square miles, 95% of which is forested. It is the most visited National Park in the National Park System with over 9 million visitors a year. Here's downtown Pigeon Forge, a small community nestled snugly in the Great Smoky Mountains. Pigeon Forge turns into a fairyland at night with the buildings brightly lit. This is the old mill. That's right. None other than Dolly Parton, one of country music's best known artists. But that's not all Dolly is famous for. 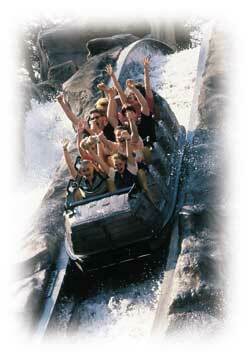 This is Daredevil Falls, one of the myriad of rides in DOLLYWOOD Theme Park. Dolly was born and grew up in Pigeon Forge, TN, and this park was named for her. We could spend all day here, but I think it's time to get moving, and let's head for Chattanooga. HAVE Y'ALL ENJOYED THE SMOKIES? 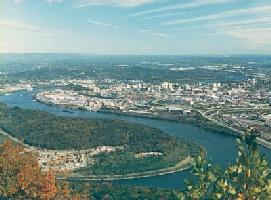 Mocassin Bend on the Tennessee River meanders through Chattanooga. There's a lot to see here, but we're going to touch on a few major places and then it will be time to move along. 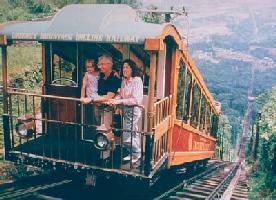 No visit to Chattanooga is complete without a ride on the Lookout Mountain Incline Railway. Almost a mile long, it has been in continuous operation since 1895. It is the steepest passenger railway in the world with a 72.7% grade. 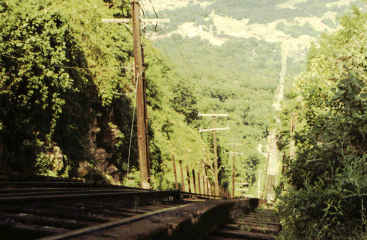 The incline is about 2,000 feet long rising 1,450 feet up Lookout Mountain. There are two cars. One has flanges on the inside; the other on the outside. This allows the cars to pass midway with no moving parts as they cannot turn around. Coolidge Park is an exciting new downtown park on Chattanooga's northshore waterfront. 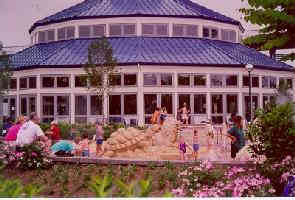 It features a beautifully-restored carousel, a pavilion, interactive water fountains and lot of open space. 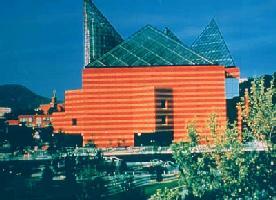 The Tennessee Aquarium is the world's largest fresh-water aquarium. You can journey through a spectacular 60-foot canyon and two living forests where you will find over 9,000 animals that swim, fly and crawl in natural habitats. 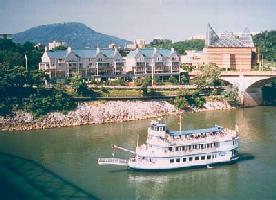 Tennessee River cruises on the Southern Belle are a popular pasttime during the summer months. That's the Tennessee Aquarium in the background. This is Lover's Leap, and, yes, many, many years ago, some star-crossed lovers decided to end it all by leaping from this cliff. Today, some choose to take a safer route down. No, thank you. 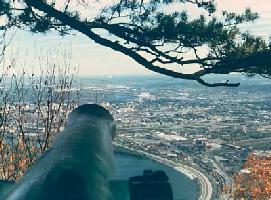 Here's a beautiful view of Chattanooga from Point Park on top of Lookout Mountain. Also on top of Lookout Mountain is Ruby Falls. 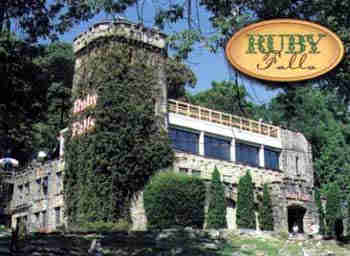 This is Ruby Falls Castle, and the entrance to the elevators that will take us 165 feet below the surface of the mountain. This is our reward for the somewhat disconcerting elevator ride. 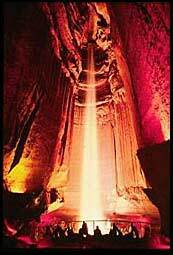 This is Ruby Falls, the highest underground falls in America. It plunges 145 feet from the ceiling of the cave. I guess to some who have never visited, The Incline Railway, Rock City and Ruby Falls may appear to be the typical "tourist traps." Believe me, there are no disappointments here. They are all well worth seeing. Did you enjoy Chattanooga? Hope you enjoyed your visit here, but now it's time to head for our neck of the woods - Tennessee's highlands. Just click on the license plate below, climb in our Chevy, and let's go!